Charles Frank Claybourn was born on 15 November 1865 to William Divine Claybourn and Elizabeth Maxey, at Texico, Illinois, in his father’s large two story house. He lived all his life in the same neighborhood, engaging in farming and stock raising and working a portion of the original farm of his father. Six children were born to Charles and Lavada, but in 1918 tragedy struck this happy family. In the influenza epidemic that swept the country during World War I, Lavada and their oldest daughter Mable were both stricken and died within the same month. [Mable died on 8 November 1918 and Lavada died about two weeks later on 21 November 1918.] (Ethel Claybourn Hawkins, a niece, also died from it two months later.) At this time one of the sons, Harley, was overseas in France where heavy fighting was taking place. He had not had any news from home for two months, and on New Year’s Day, 1919, he received a packet of mail informing him that he had lost his mother and sister. He went into a state of shock at the news. The young girl in front is Eula. Others left to right are Montie, Mable Pearl, Charles, Frank, Harley, Pearl Howard (married to Sophie), Lavada, and Sophie. Charles died on 21 July 1939 and is buried with his wife at Jordan’s Chapel Cemetery in Jefferson County, Illinois. Mable Pearl Claybourn was born on 23 December 1886 in Texico, Illinois. She died of influenza just before her twenty-second birthday on 8 November 1918. She never married. Mable is buried in Jordan Chapel Cemetery. Frank Williams Claybourn (click name for separate biographical sketch) was born on 3 July 1888 and died on 30 September 1957. Sophia Jane Claybourn (click name for separate biographical sketch) was born on 14 January 1890 and died on 30 June 1982. Harley Paul Claybourn was born on 20 September 1894 in Texico, Illinois. He served in the U.S. Army from September of 1917 to July of 1919, which included eighteen months in France during World War I. 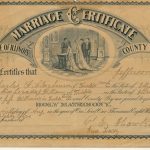 On his draft registration card he listed his occupation as “farm hand” and indicated that he was short, with medium build, blue eyes, light hair, and a “crooked arm.” He married on 13 December 1919 to Eula Blossom Howard. [Eula Howard was born on 4 September 1895 in Kell, Illinois, to Hezekiah Howard (1847-1920) and Mary Jane Quick (1852-1936).] Together they had two children, listed below. He worked thirty-eight years for Sinclair Refining Company, living in Centralia and Lincoln, Illinois. Later he worked as Maintenance Superintendent for Central Illinois, retiring on 30 September 1959. Harley died on 11 December 1978 and Eula died on 16 November 1991. They are buried together in Jordan Chapel Cemetery. Billy Dwain Claybourn was born on 4 July 1922 in Centralia, Marion County, Illinois, and died there on 2 September 1922. He is buried in Jordan Chapel Cemetery. Glenadean Claybourn was born 14 April 1927 in Lincoln, Illinois. She graduated from Stephens College in Columbia, Missouri, majoring in aviation and was a licensed pilot. The family enjoyed flying together. She married on 27 June 1948 to Lyman James Garrison, a part owner in the Lincoln Transfer Trucking Company. [Lyman Garrison was born on 23 February 1921, to Charley H. and D. Edith Turner Garrison in Wayne County, Illinois. His family moved to Peoria, Illinois, where he attended grade and high schools. Lyman married Lois Johnson in 1937 and they had a daughter, Bonnie (Garrison) Vacca. They appear to have divorced. During World War II he served as a Merchant Marine in the Atlantic, Pacific, and Mediterranean theatres. After the war, in 1947, he and his father started Lincoln Transfer Trucking Company, acquired later by his brother, Charles Dale Garrison. During the late 1940s and early 1950s, Lyman was a fast pitch softball pitcher for the Caterpillar Diesels, Keystone Steel & Wire, and Lehn & Fink teams. He founded Garrison Insurance Agency and Lincoln Heritage Commercial Investment Corporation serving as their President for many years. Also, he was a founding principle of Old Heritage Life Insurance Company and served as Executive Vice President and Treasurer. Lyman served as a member of the Board of Directors that built the current Logan County Safety Complex. Lyman died on 22 June 2013.] They lived in Lincoln, Illinois and had one child, listed below. Lyman and Glenadean later divorced. James Paul Garrison was born on 28 January 1953. He married Connie Dittus. Ryan James Garrison married Perla Herrera and they had a son, Wyatt James Garrison. Montie Ephraim Claybourn (click name for separate biographical sketch) was born on 14 September 1900 and died on 16 April 1968. Eula Belle Claybourn was born 3 January 1905 in Texico, Illinois. 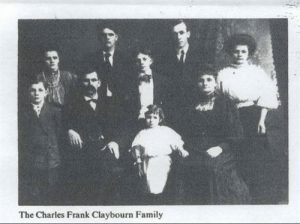 Eula and her father are the only ones of the family who lived continuously on part of the land which originally belonged to William Divine Claybourn. Eula married on 25 October 1924 to Charles Glenn Osborn (known as “Glenn”). [Charles Glenn Osborn was born on 20 May 1905 to Joseph and Elva Osborn.] Mr. Osborn’s family received a grant of land near the Claybourns in 1855 from the Shawneetown land office. They farmed and raised stock, primarily white faced beef cattle dairy cattle. They had one child, listed below. In the 1940 census they indicated Glenn’s grandmother and a lodger (Earl Harlow) were also living with them. [1940 United States Census, Field Township, Jefferson County, Illinois, accessed through Ancestry.com. Earl Harlow indicated he was forty-nine years old and worked on a nursery.] Charles Glenn Osborn died on 16 August 1989 in Denton County, Texas, and Eula died on 12 March 1990 in Collin County, Texas. They are buried in Jordan Chapel Cemetery. Imogene Jane Osborn was born 9 February 1932 in Texico, Illinois. 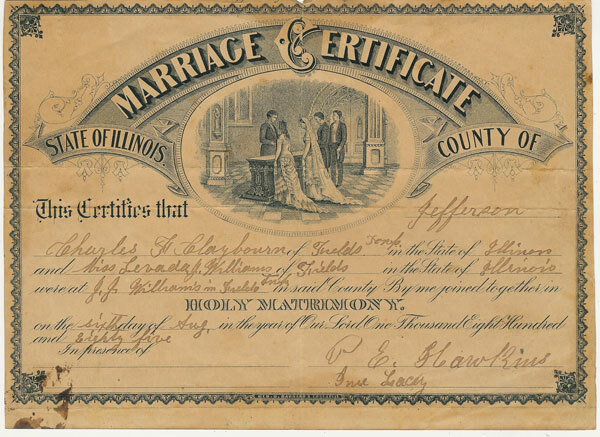 She married at the age of eighteen on 20 May 1950 to Ralph S. Gorline (born on 17 May 1925 in Bond County, Illinois). Ralph worked for Cheatham Trucking Service. Imogene was killed in a tragic truck accident at the age of twenty-six on 4 November 1958, near Greenville, Illinois. The trailer from a tractor-trailer came loose and demolished the pick-up truck she was driving. Before her death she and Ralph had one child, listed below. She is buried at Jordan’s Chapel. Ralph married again about six weeks after Imogene’s death to Betty Strohkirch and they had a son Karl (1959-1996). Ralph died on 24 February 1992 in Jackson County, Mississippi. Sharon Joyce Gorline was born 16 February 1954. She was reared by her grandmother, Eula, in Texico, Illinois. In 1971 she graduated from the Mt. Vernon, Illinois township high school. She married (1st) Hubert E. Timmons on 24 December 1972. Hubert served in the armed services and Joyce in the Air Force technical training. They divorced on 29 September 1980 in Brazoria County, Texas. She married (2nd) Michael Whitehead on 1 September 1983. Michael hailed from Arkansas and the two moved to Addison, Texas (just outside of Dallas) in 1984.